Peering through a giant cosmic magnifying glass, NASA’s Hubble Space Telescope has spotted one of the farthest, faintest, and smallest galaxies ever seen. The diminutive object is estimated to be over 13 billion light-years away. This new detection is considered one of the most reliable distance measurements of a galaxy that existed in the early universe, said the Hubble researchers. They used two independent methods to estimate its distance. The galaxy was detected as part of the Frontier Fields program, an ambitious three-year effort, begun in 2013, that teams Hubble with NASA’s other Great Observatories — the Spitzer Space Telescope and the Chandra X-ray Observatory — to probe the early universe by studying large galaxy clusters. These clusters are so massive that their gravity deflects light passing through them, magnifying, brightening, and distorting background objects in a phenomenon called gravitational lensing. These powerful lenses allow astronomers to find many dim, distant structures that otherwise might be too faint to see. In this new discovery, the lensing power of the mammoth galaxy cluster Abell 2744, nicknamed Pandora’s Cluster, produced three magnified images of the same galaxy. Each magnified image makes the galaxy appear as much as 10 times larger and brighter than it would look without the intervening lens. An analysis of the distant galaxy shows that it measures merely 850 light-years across, 500 times smaller than the Milky Way, and is estimated to have a mass of only 40 million suns. The galaxy’s star formation rate is about one star every three years (one-third the star formation rate in the Milky Way). Although this may seem low, Zitrin said that given its small size and low mass, the tiny galaxy is in fact rapidly evolving and efficiently forming stars. Zitrin’s team spotted the galaxy’s gravitationally multiplied images using near-infrared and visible-light photos of the galaxy cluster taken by Hubble’s Wide Field Camera 3 and Advanced Camera for Surveys. But at first they didn’t know how far away it was from Earth. Normally, astronomers use spectroscopy to determine an object’s distance. The farther away a galaxy, the more its light has been stretched by the universe’s expansion. Astronomers can precisely measure this effect through spectroscopy, which characterizes an object’s light. But the gravitationally lensed galaxy and other objects found at this early epoch are too far away and too dim for astronomers to use spectroscopy. Astronomers instead analyze an object’s color to estimate its distance. The universe’s expansion reddens an object’s color in predictable ways, which scientists can measure. Members of Zitrin’s team not only performed the color-analysis technique, but they also took advantage of the multiple images produced by the gravitational lens to independently confirm their distance estimate. The astronomers measured the angular separation between the three magnified images of the galaxy in the Hubble photos. The greater the angular separation due to lensing, the farther away the object is from Earth. 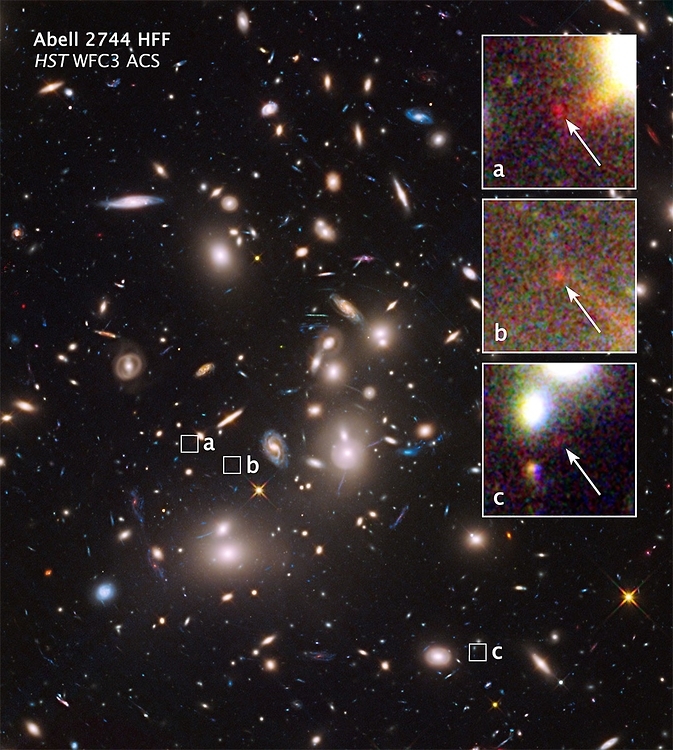 To test this concept, the astronomers compared the three magnified images with the locations of several other multiply imaged objects lensed by Abell 2744 that are not as far behind the cluster. 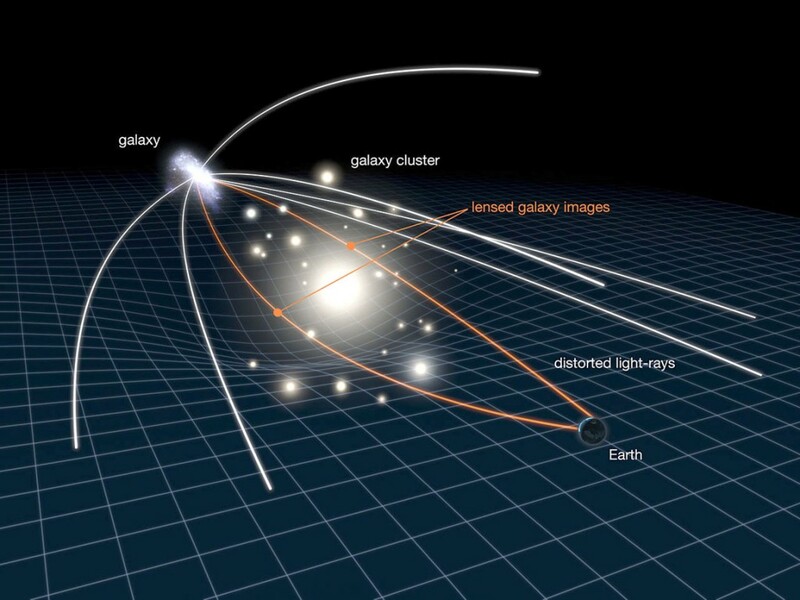 The angular distance between the magnified images of the closer galaxies was smaller. Astronomers have long debated whether such early galaxies could have provided enough radiation to warm the hydrogen that cooled soon after the big bang. This process, called “reionization,” is thought to have occurred 200 million to 1 billion years after the birth of the universe. Reionization made the universe transparent to light, allowing astronomers to look far back into time without running into a “fog” of cold hydrogen. The team’s results appeared in the Sept. 5 online edition of The Astrophysical Journal Letters. This article is a press release from NASA. See the original here. Could Mimas’ Wobble Tell Us What Lies Beneath Its Surface?